We have vast experience with large commercial projects. Although we mostly work in commercial settings, we occasionally take on residential work. Let us help you with your new construction, or replacement of your driveway, basement, sidewalk, or patio. Architectural or decorative concrete has become one of the most popular ways to add curb appeal to your home or business. 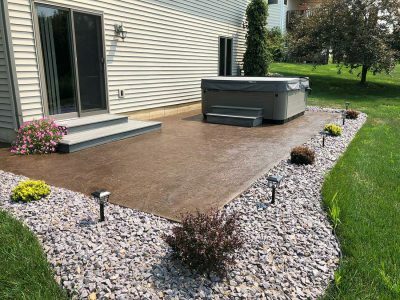 Valley Concrete offers endless designs and solutions for exterior surfaces including sidewalks, patios, pool decks, driveways, and custom residential pours. Integral colored concrete can add beauty and value to any style of property. Our concrete can be poured in a wide range of colors: warm earth tones, pastel shadings, deep hues, and any shade of gray ranging from subtle to dark. Polished concrete can enhance the look of your office, showroom, or commercial business. 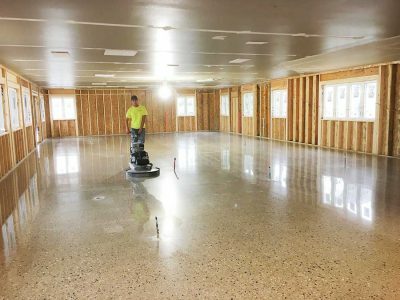 Polished concrete is extremely durable and easy to maintain. We can polish existing slabs or work with new construction as well. No, we offer free estimates and consultations. We work within a 50 mile radius of Spring Green, Wisconsin for residential projects. We do consider a larger radius for commercial projects. This can be discussed during your initial consultation. Q. When can I drive on my driveway? Typically, we recommend you wait 7-10 days prior to vehicle traffic. Full curing time is 28 days. Q. Why should I choose concrete over asphalt for my driveway? A good quality concrete driveway will last more than 30 years with minimal maintenance. Asphalt driveways require regular seal coats and will deteriorate more quickly due to environmental factors and vehicle traffic. Q. What steps do you take to ensure I am getting a quality product? The key to quality concrete projects is a good sub-base. 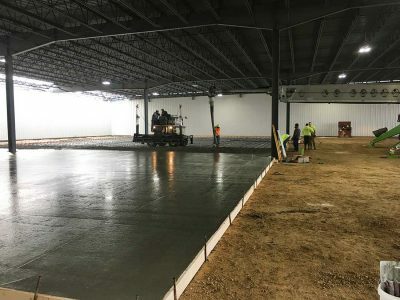 We place and compact crushed limestone beneath all of our flatwork. We only pour a quality concrete mix with Lycon, Inc.